aMember is a platform that helps businesses manage their membership. Designed for businesses selling digital products and downloads, such as eBooks, software, audio files, and images, aMember presents a plethora of features and capabilities to help users manage their subscriptions, accept payments, and deliver their goods to the consumers. 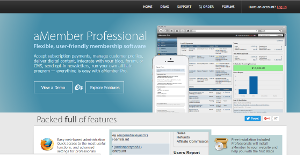 aMember is a very flexible and straightforward membership management tool that boasts of simple web-based administration and easy access to its users. The system also offers integrations and compatibility with the leading payment gateways (PayPal, 2CheckOut, Stripe), content management services (WordPress), and shipping applications (ShippingCart). It also comes with an integrated helpdesk as well as a full-featured affiliate module. With aMember, reliable customer support will always be an email away from responding to all of your questions and solving all of your queries. A set of training materials is also available for novice users looking to maximize the potential of their membership system. We also invite you to check the free demo, and familiarize with the features of this popular system. aMember simplifies all aspects of membership management for businesses that delves in digital goods and downloads. For one, it offers unlimited membership levels and can store unlimited number of items. With its incremental content delivery capability, users can drill down their content on a daily basis, ensuring that customers are subscribed and billed. Featuring seamless integrations with tons of payment platforms like PayPal, 2Checkout, 1ShoppingCart, ClickBank, Plimus,SWREG, WorldPay, Zombaio and many more, businesses will have no hard time receiving payments and customers paying. aMember is all about fast and easy membership management. This tool makes it easy for subscribers to sign up, send payment, retrieve a lost password, configure their data, and cancel their subscriptions. For administrators, it is very easy to create coupon codes for their subscribers as well as manage coupon usage and validity. The tool also comes with its own Affiliate Program built in. Boasting of very deep integration to its core, aMember Pro’s affiliate management module makes quick work of handling and managing recurring billing, refunds, and chargebacks. Email management is also a breeze. Users can create and manage their own email lists, bulk send e-mails even on shared webhostings, or deliver specific emails to selected customers. Users can also set up auto responders and send them on specific dates after purchase. On top of that, aMember is a well integrated and reasonably priced system, which can easily meet the needs of every company, and function impeccably in any software ecosystem. Reliable customer support is another important reason for users to consider aMember as their future membership system. There are well-liked and widely used solutions in each software group. But are they necessarily the best fit for your organization’s specific needs? A trendy software product may have thousands of users, but does it present what you need? For this reason, do not blindly invest in popular systems. Read at least a few aMember reviews and consider the aspects that you desire in the software such as the cost, main functionality, available integrations etc. Then, choose a few solutions that fit your requirements. Try out the free trials of these products, read online reviews, get information from the vendor, and do your research systematically. This in-depth research is sure to help you choose the finest software solution for your company’s special wants. How Much Does aMember Cost? We realize that when you make a decision to buy Sales Management Software it’s important not only to see how experts evaluate it in their reviews, but also to find out if the real people and companies that buy it are actually satisfied with the product. That’s why we’ve created our behavior-based Customer Satisfaction Algorithm™ that gathers customer reviews, comments and aMember reviews across a wide range of social media sites. The data is then presented in an easy to digest form showing how many people had positive and negative experience with aMember. With that information at hand you should be equipped to make an informed buying decision that you won’t regret. What are aMember pricing details? What integrations are available for aMember? If you need more information about aMember or you simply have a question let us know what you need and we’ll forward your request directly to the vendor.